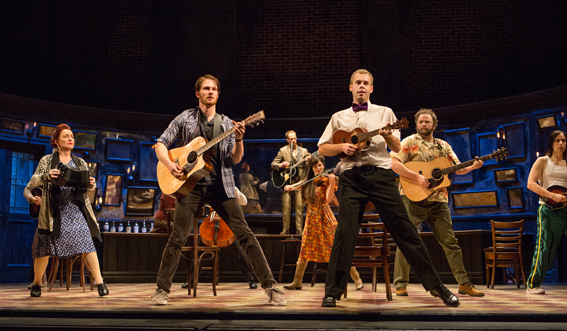 Award-winning musical ‘Once’ returned to Canada on 10 February 2015 to start a 111-day run at Toronto’s Ed Mirvish Theatre. Having enjoyed a particularly successful stint in the city during the show’s North American Tour in 2013, Once’s producers decided to re-visit for an extended stay. Sound designer, Clive Goodwin, has created a new audio concept for the production that is, once again, formed around a Funktion-One sound system. Set in modern day Dublin, Once is the story of a guy who gives up on his love of music and the girl who inspires him to dream again. The show is being performed by an all-Canadian cast of actor-musicians. A 63-day run was announced last year but demand for tickets, even before it opened, has seen that extend by almost seven-weeks. The sound system comprises 10 Funktion-One Resolution 3 SH skeletal speakers, nine F55 speakers, four F121 bass enclosures and four RM15 wide-dispersion monitor speakers. Once had already won a Grammy for Best Musical Theatre Album, an Academy Award for Best Song and eight Tony Awards before it made its way across the Atlantic to London’s West End in 2013. Included in that haul of eight Tony Awards, was Best Sound Design of a Musical, which was awarded to Goodwin. He was also nominated for Best Sound Design at the Olivier Awards in 2014, narrowly missing out, while the show did pick up an Olivier for Outstanding Achievement in Music.